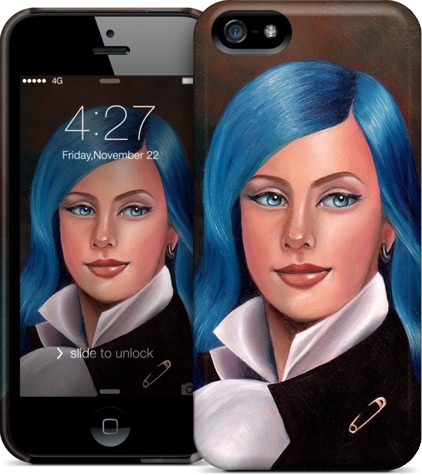 Dress Up Your Devices with My Art! I had seen the prints that Society6 has done over the years at people’s homes, and thought they were pretty good. Perhaps Society6 should have stuck with them alone. The amount of people who told me they got orders refunded because of shoddy cheap products was finally getting to me (and that is just the people who told me!) I admit that both my iPhone cases cracked in a strange area — I don’t think I ever dropped it. I’m not a fan of my art on throw pillows, tote bags, or any of that nonsense. The other thing was Society6 didn’t have iPad cases or anything for Kindle. Well, as of now you can find skins for all those things, even Nook and other products! I’m curious to know how well the prints on fancy paper, and on canvas turn out, so someone order a few and let me know!